In the course of the six- and eight-lane expansion of the A7 motorway, three tunnels will be constructed in several districts of Hamburg for noise protection reasons. PTV Transport Consult was commissioned by Deutsche Einheit Fernstraßenplanungs- und -bau GmbH DEGES to carry out the safety analyses and assessments. Tunnel safety is one of our areas of expertise. Together with our clients, we develop solutions that enable energy- and cost-efficient and, above all, safe operation of tunnel systems. In Hamburg West, a pioneering European noise protection project is being developed. As part of the expansion of the A7 by two lanes north of the Elbtunnel, the so-called ‘Hamburger Deckel’ (tunnel cover), consisting of tunnels and walls, will run through the districts of Altona, Stellingen and Schnelsen. The PTV consultants were responsible for the safety concept for these important infrastructure elements (Photo: DEGES). The tunnels will be designed as twin-tube tunnels with one tube per direction of travel. The cut and cover construction method is used to build the tunnels with a rectangular cross-section. There are three or four main traffic lanes per tube, one side lane (breakdown lane) as well as an additional exit or entry lane in the area of junctions. The tunnels have a length of 2.230 m (Altonatunnel), 893 m (Stellingtunnel) and 550 m (Schnelsentunnel). Inside the tunnels, there will be emergency exits to the neighbouring tube spaced 60 metres apart. 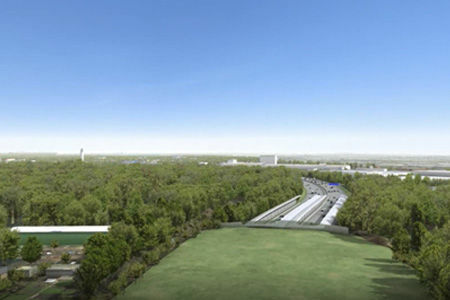 The tunnels will be monitored and controlled by a control centre manned 24 hours a day and connected to the Hamburg tunnel control centre (TLZ), which is to be created in the course of the expansion. Due to the great importance of the A7 for regional and supra-regional traffic, the expansion will be carried out while maintaining the current traffic level. First, the tubes for one direction of travel will be constructed. After their completion, as part of the second construction phase, the second set of tunnels will be constructed while routing the bi-directional traffic through the first set of tubes. Finally, oncoming traffic will be routed through the second set of tubes. In addition, PTV carried out the dangerous goods analyses in compliance with the procedure for categorising road tunnels according to ADR 2007 (Stages 1a, 1b, 2a, 2b). In addition, the PTV experts carried out sensitivity analyses and parameter studies in order to show the effects of parameter changes.